Sometimes shooting isn't just about standing at a firing range. Sometimes you don't have the luxury of a lot of space to handle your rifle in. You might need to be in a vehicle, or in an enclosed space for home defense. In these situations, the INTRAFUSE® AK Folding Stock is your best option. The stock enables you to fold it to the right to drastically reduce the length of the rifle. When needed, you can easily deploy it back to its open position for a rigid shooting platform. The stock even provides a sling attachment point in the knuckle. 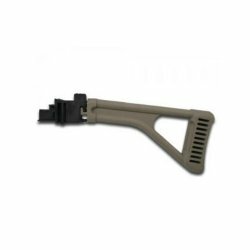 Made of high strength composite, you'll be sure that you've got the highest quality folding stock at your disposal whenever you need it. Not compatible with milled or slant-cut receivers, receivers with a bottom tang, underfolder AKs, or Yugo / PAP models.